Cloudveil is one of only two companies this year (the other being Simms) whose partnership with W. L. Gore enabled them to introduce Pro Shell fabric into their gear. The result is an upgrade for their popular 8x line of waders to the new 8x Pro. Like some other top-end waders for 2008, the 8x Pro Wader ($475) uses five layers of waterproof fabric on the legs and three on the upper sections. A fixed fly-box front pocket sits above the waterline, dual-zip kangaroo pockets warm hands and adjustable tri-point suspenders clip off for easy removal. The 8x boot has also been redesigned and is now the 8x Stealth Boot ($135), but it remains one of the lightest boots we’ve ever worn. And Cloudveil’s new Hell Roaring Wader is a new design using their Cloudburst Emergence technology in a moderately priced package ($240). Fly fishers will be happy to hear that retail prices on most of Simms‘s top waders are $50 or more lower than last year’s high end models. Some of the price reductions come in redesigns — the new G4 model discards the $79 waterproof zipper, for example — but our general impression after the FFR show product tour is that Simms knows that simplifying design and putting their energies into the technology to make gear lighter, more comfortable and more durable is where the secret to growth lies. As in the past, Simms’s top-end 2008 breathable waders represent the leading edge of feature-rich wader design, with thermolaminated fabric chest pockets for fly boxes, built-in belt loops, 4mm neoprene in the booties, and more 5-layer fabric than anyone else puts into their product. But the big news for the G4 and G3 waders in 2008 is the use of W. L. Gore’s new Gore-Tex® Pro Shell fabric, which is 10% lighter and thinner and uses a Micro Grid backer fabric designed to improve durability while increasing comfort. Additionally, Simms seemed to really get their act together this year when it came to designing product for women. Case in point: the new Women’s Gore-Tex Stockingfoots ($329.95). No frills or foo-foo here, just very well-thought-out choices (e.g. the fleece-lined hand warmer) in making an attractive wader for women that incorporates the best of previous models. Simms also revamped their entire wading boot line, changing the lasts to provide more comfort and support in products like the durable G3 Guide Boot, which they introduced last year, and adding three completely new boots to the lineup. 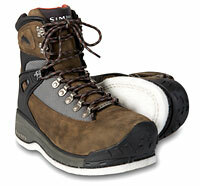 The new Guide Boot ($159.95) is a lighter version of the all-leather G3. The Rivershed™ Boot ($139.95) is Simms’s answer to the demand for more athletic styling and uses easy-to-clean synthetic materials. And the Headwaters™Boot is an under-$100 boot that weighs only 35 ounces. Chota‘s new breathable Abrams Creek II Sockfoot Waders have a great price — $165 — and pack a lot of extras. Integrated gravel guards, two-layer knee panels, articulated knees and dual-taped neoprene socks are standard. L.L. Bean has updated their popular West Branch Wading Shoe ($79), which feature fast-drying synthetic uppers and a choice of felt or sticky rubber bottoms in men’s styles (women’s are rubber-only). Orvis introduces their new Pro Guide III Waders ($329), Silver Label XT Bootfoot Waders ($298/329) and Clearwater Endura Bootfoot Waders ($198) in early 2008. They also have three new products in their fishing footwear line: collapsible Pack and Travel Boots ($59), the Pull-On Flats Hiker ($89), and the Clearwater Rubber Sole Bottom wading shoe. ($59/79/89). Happy with the performance of the Watermaster II waders introduced last year, Patagonia put considerable attention into making their boots more comfortable and practical for 2008. Specifically they added new “flex zones” to almost every boot in their line, with the idea that they could increase both comfort and durability. They also have a brand new Surf Sneakers ($120) product that was designed for beach and boat versatility. The Surf Sneakers are more flexible in the sole than the their classic Marlwalker RDS flats boot couterparts and follow Patagonia’s guiding principle of giving anglers the lightest, most earth-friendly footwear they can make. What’s more, they don’t mark boat decks. Meanwhile Hodgman continues to provide excellent value in waders with their new Men’s Colorado River Breathable Stockingfoot Wader ($109.95) and Women’s Ahava Breathable Stockingfoot Chest Wader ($109.95). We’re giving extra style points to the desiger of the Ahava waders for going with the appealing deep red color. Finally, Korkers is offering a new Guide Boot ($159.99) in 2008 that uses the same Boa Dial system they introduced last year. The new leather boot features protective rubber toe guards, mono mesh panels and triple-stitched construction.